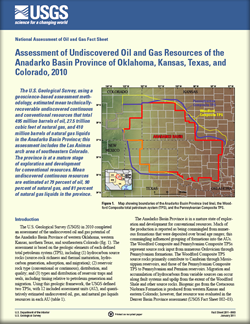 The U.S. Geological Survey, using a geoscience-based assessment methodology, estimated mean technically-recoverable undiscovered continuous and conventional resources that total 495 million barrels of oil, 27.5 trillion cubic feet of natural gas, and 410 million barrels of natural gas liquids in the Anadarko Basin Province; this assessment includes the Las Animas arch area of southeastern Colorado. The province is at a mature stage of exploration and development for conventional resources. Mean undiscovered continuous resources are estimated at 79 percent of oil, 90 percent of natural gas, and 81 percent of natural gas liquids in the province. Higley, D.K., Gaswirth, S.B., Abbott, M.M., Charpentier, R.R., Cook, T.A., Ellis, G.S., Gianoutsos, N.J., Hatch, J.R., Klett, T.R., Nelson, Philip, Pawlewicz, M.J., Pearson, O.N., Pollastro, R.M., and Schenk, C.J., 2011, Assessment of undiscovered oil and gas resources of the Anadarko Basin Province of Oklahoma, Kansas, Texas, and Colorado, 2010: U.S. Geological Survey Fact Sheet 2011–3003, 2 p.